Dave's Beer: A picture of a cat on a blog, pretty original, eh? A picture of a cat on a blog, pretty original, eh? 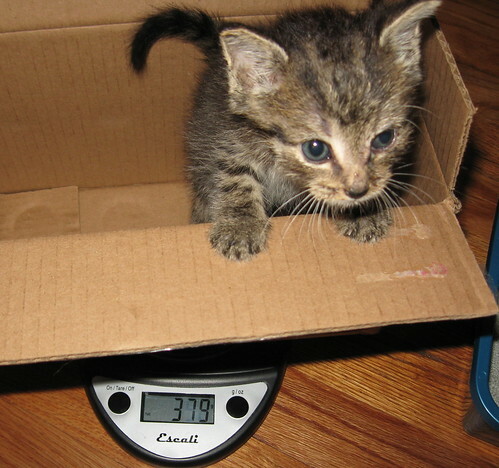 379 grams, and it's a boy (still struggling though), originally uploaded by Seligmans Dog. New information. It's a he. I think his name is Fuzz. He's got a cold and his survival is not certain. We started monitoring his weight. He's 379 grams so far. He's also got the coolest ears. If you haven't already done it you might want him checked for feline distemper-symptoms are very similar to a cold. Love to all- He is cute. Sounds like you had the same problem we did sexing Clement- he started out as Clementine! That's funny. She/he was almost the exact same name. One of the female candidates was Clementine. She seems pretty well final with Fuzz.